A problem shared is not often a problem halved. Sometimes the more you share your problems the more you tie yourself in knots. People offer opinions and advice but there’s no guarantee that anyone’s going to come up with a likely solution. The problem with problems is that everyone’s got them. Some are simple whilst others are complex. Problems present themselves at every turn – whether you’re a prince or a pauper - and there’s usually one (or two) looming on the horizon. We wake up to them, we get sick over them, we ignore them, we get into arguments about them until eventually we sleep on them. 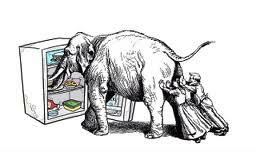 How do you get an elephant into a fridge? Though we might seek help from friends to soothe our care-worn spirit and sympathise with our worries they can’t provide anything more than moral support. That’s because it’s rare for someone else to truly empathise with your life predicament. After all, they've never walked a day in your shoes! Face up to the truth - your friends just don't want to sift through your pile of bullsh** or have their ears chewed off by a moaning minnie! Friends will offer temporary comfort and advice but it is up to you to put in the effort into finding a resolution. 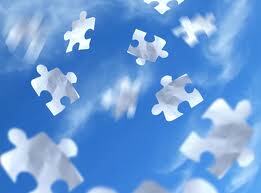 Solutions don’t just drop into your lap – it takes a great deal of mental energy to figure them out. Sharing your problems is always a private matter. You don’t discuss it on Facebook with 246 “friends” –if you do you may receive 246 responses – how confusing is that?? Close friends know you well enough but we all have secret places inside of us where our insecurities lie. Problems are your insecurities unmasked. If you’re a DIY evader you’ll soon find that the roof’s sprung a leak or a drain’s blocked. If you hate creepy crawlies you’ll no doubt find a spider or two in the bath. If you hate raucous, social gatherings you’ll find yourself inundated with invitations to them. Anything that challenges your emotional security will have you coming up with numerous obstacles and excuses. You attract what you fear most. Every insecurity is a potential problem. So instead of sharing our problems we need to do some tinkering from the inside. Looking inward takes courage. We’ve spent so long running away and hiding that it’s hard to look our deficiencies in the eye. Often we’ll need help in correcting them. That’s when professional help is useful. Change and responsibility is the biggest commitment we can make to problem solving. Indeed something's gotta give! Hopefully we can hold on to our sanity before we experience full meltdown. To make meaningful change happen you usually have to upset a few people.Everyone resists change and that perhaps is the biggest problem of all. Once you share your ideas about change you’ll be wandering around in the wilderness. You’ll become a social pariah or worse. Half of your problem is sharing them so be subtle. Save them for your inner circle or those you consider enlightened enough to offer tried and tested solutions. If not, shut up and open your mind!